If your trees are too tall or your neighbors lights too bright, there are places around Austin that can give better views of the sky. Be aware of your surroundings. Neighborhood parks and schools in single family residential areas are likely to be safest. Check out restroom access and parking beforehand. Most local parks have a nominal 10PM closing time. 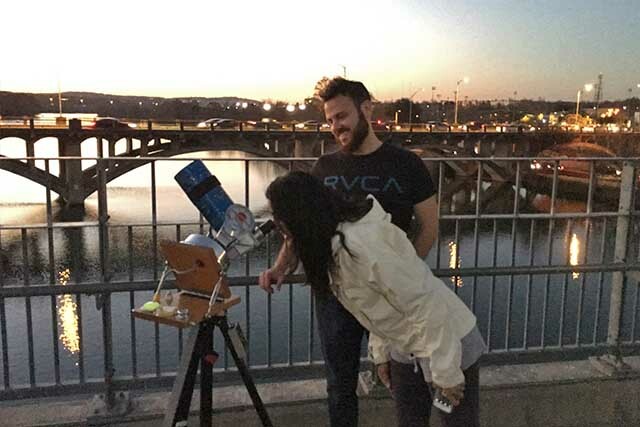 If you have a clear purpose (telescope) and non-threatening appearance, you are more likely to have an outreach opportunity than be challenged. It helps to be friendly if you are asking to bend the rules. Help me to expand this list of good spots to observe in town. Send your favorites with description including: web links, information about access, hours, restrooms, parking, and maps to the contact address and I'll add them.